Planar Monolithic Industries (PMI) recently introduced four new products in their extensive line of RF and microwave components. Included are a 1-18 GHz low noise amplifier; a 1 to 18 GHz, 10-bit digital RF attenuator; a 1 to 12 GHz high speed threshold detector; and a 2 to 18 GHz SP6T PIN diode RF switch. Contact PMI today for more information. PMI Model No. PE2-30-1R018R0-4R5-22-12-SFF-1 is a 1.0 to 18.0 GHz, low noise amplifier that typically provides 30 dB of gain while maintaining a maximum gain flatness of ±1.5 dB over the operating frequency. 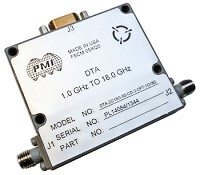 The noise figure is 4.5 dB maximum and offers an OP1dB of 22 dBm minimum. The operating voltage is +12 to +15 VDC with a typical current draw of 500 mA. 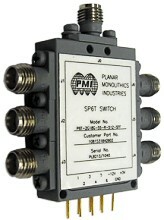 The unit is supplied with removable SMA(F) connectors in our standard PE2 housing. PMI Model No. DTA-2G18G-60-CD-2-OPT-1G18G is a non-reflective, 10 Bit, programmable 60 dB, pin diode attenuator with step resolution as low as 0.06 dB over the frequency range of 1.0 to 18.0 GHz. Specifications include insertion loss of 4.5 dB; VSWR 2.0:1 maximum; attenuation accuracy of ±1.0 dB @ 0 to 20 dB, ±1.5 dB @ 20 to 40 dB and ±2.0 dB @ 40 to 60 dB; typical attenuation flatness of ±1.0 dB @ 20 dB, ±1.25 dB @ 40 dB and ±3.0 dB @ 60 dB; switching speed 1.0 µs and This model is offered in a slim line housing measuring 2.0” x 1.8” x 0.5" with SMA female connectors and 15 PIN Micro-D-Female control connector. Mating Micro-D Male connector supplied. PMI Model No. TD-1G12G-RL-CD-SFF-NH is a High Speed Threshold Detector designed to operate over the 1 to 12 GHz Frequency Range, with an Adjustable Threshold Level of -30 to -10 dBm, VSWR of 3.0:1 Typical. This Unit comes in a Very Small Size with Field Removable SMA Connectors on the Input and Output. This unit has an active High output. PMI Model No. P6T-2G18G-55-R-512-SFF is a high speed, single pole, six throw, reflective switch capable of switching within 15 ns. The frequency range is 2.0 to 18.0 GHz and has over 55 dB of isolation. This model was designed to produce very low video transients of 15 mV peak to peak and a video transient spectral content of -65 dBm maximum. 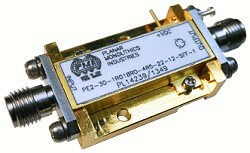 Features include TTL control, SMA female connectors, small package size 1.0" x 1.4" x 0.3".